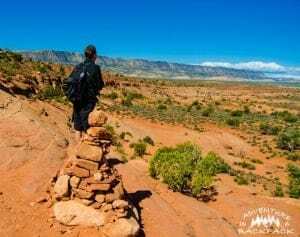 After being hulled up in the motorhome for a few days of nasty weather, we were chomping at the bit to get out and have an adventure in Grand-Staircase Escalante National Monument. We had been in the area for a few days just waiting for the weather to clear up so we could explore. 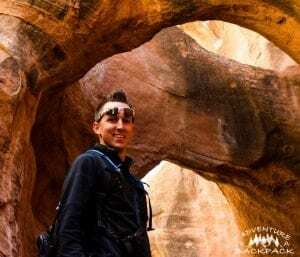 Finally, we got a break in the cold, windy weather and headed over to Spooky and Peekaboo Slot Canyons. We had been told by several locals that these were the best ones in the area, and they were rated as “easy” so as novice canyoneers we weren’t too worried. 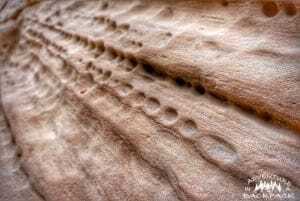 As mentioned, we were new to canyoneering, but we had been anticipating slot canyons for a while. Slot canyons are very deep and narrow canyons that are formed by water erosion from rushing through them during heavy rains. Slot canyons are dangerous places to be when the weather turns, as they are very well known for flash flooding and even some very experienced climbers have died in them. Not to scare anyone, just a warning that as with any adventure, it can be hazardous! Of course, we watched the weather and had a sunny, clear day with no precipitation forecast, so we were good to go. After about a mile to mile and a half hike to get to the entrance, we came to the entrance of Peekaboo Slot Canyon. The entrance was a bit of a scramble to get up, and there was a group there telling us it wasn’t climbable without a rope. Well, as with anything, we don’t take “you can’t” lightly. So… Nate hopped right up there as they stood in awe. I scrambled up right behind him and we were on our way! It really wasn’t that difficult; there were good hand and foot holds. Never be scared away just because another group wasn’t able to complete something! Peekaboo was a narrow canyon, but not so narrow that we couldn’t get through. After coming to a wide area of the canyon that appears at first to be the end, the canyon narrows again and the slot gets a bit slimmer than before. That is about halfway through the canyon, just for reference. 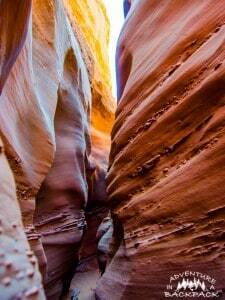 The canyon gets a little narrower but is still passable, and opens into a mouth at the end. Peekaboo was a great first slot canyon to explore! 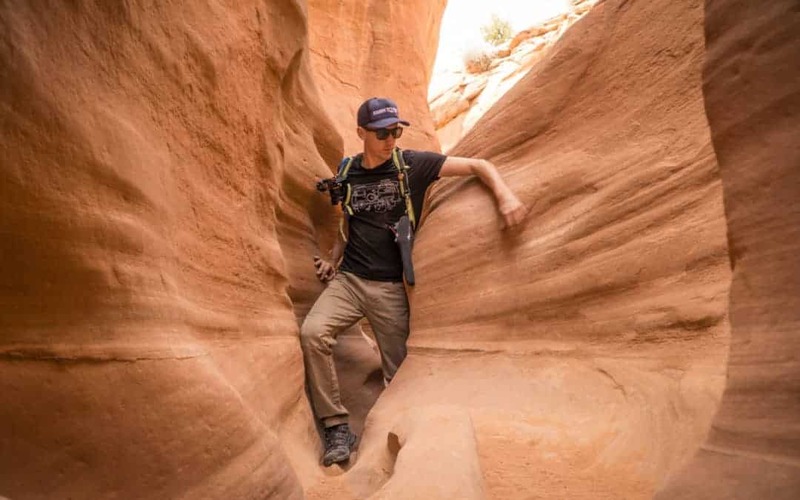 Spooky and Peekaboo Slot Canyons can be hiked in either direction and either independently or as a semi-loop. We opted for the loop to complete both of them and we started with Peekaboo and worked our way clockwise to Spooky. Working in this direction, you are going up Peekaboo and then down Spooky. Both directions would be equally as interesting. After we came out of Peekaboo, there was about a 20-minute hike across the desert land to Spooky. Right at the entrance of Spooky, we stopped for a quick bite of a Clif Bar before heading in. There was a couple stopping for a snack there as well, and we chatted with them a bit. They had turned back at a chock stone about halfway through Spooky and were not sure if we could make it past that obstacle. Another group came past us as we ate and they also said they had turned back at that obstacle. Again, we were not deterred. As we entered Spooky Canyon, it was immediately apparent that these two canyons are completely different in their makeup. Just a 20-minute walk separating the two, the type of rock and the makeup of the canyon was completely different from Peekaboo. Spooky was generally much narrower, and we had to take our packs off for most of the canyon and several parts required us to turn sideways to get through. But even in these tight spaces, it’s just an absolutely amazing feeling being in there. You look up and the canyon towers 30+ feet above your head. The rock seemingly hugs you, and you feel so small in the canyon. The ripples in the rock brush your sides as you walk through, sometimes being your only grip to hop down the next drop. 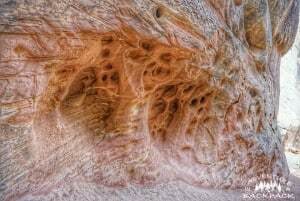 The sandstone is grippy on the walls, but the floor has been worn smooth by hikers as well as the water flushing down it. We got to the spot where everyone had said they were turning around, and we immediately saw the issue. If you go over the top of the boulder and look down, it appears to be very daunting and impossible to get down without a rope. However, if you backtrack 10-15 feet, you can go UNDER the big boulder and there are some other boulders that you can hop down. Going under the boulder initially is a bit tight, but we both made it through with no issues. After you are through that part, there is a slight drop down to the end of the obstacle. Nate was able to shimmy down, but Steph had to jump the last few feet. It’s a solid landing, though, so no big deal. *Side Note* PLEASE watch your children on any adventure you go on, especially if there are drop off cliffs and canyons. Nate had to push a kid back up that was trying to come down the wrong way while his parents paid no attention. The kid would have dropped about 15 feet down if he had let go where he was trying to jump down. No Bueno on the parents. Okay, end of PSA. Continuing through the canyon, the ever-changing formations just got more and more spectacular. It was all we could do to keep our excitement under control (okay, mainly Steph)! It did get much tighter near the end, but the excitement continued to build. It was a great experience overall! We were so pumped after coming out of Spooky and Peekaboo Slot Canyons that the hike back was a bit of a blur. To say the least, we LOVED hiking these two canyons and cannot wait to get into more. Steph compared this to the first time she went diving in the ocean; you just can’t wait to see what’s around the next corner and see how the environment changes as you move through. We would rate this five stars, easily! These slot canyons were rated as “Easy” on all of the maps and routes we read. Our description of an “easy” hike would be something that anyone could easily hike with no issue. 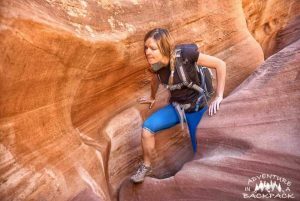 Well, with the number of individuals (and seemingly very fit individuals) that were turning back on these canyons, we would not rate it as “easy.” Our rating would be “moderate” to encompass the obstacles on the route.